There are so many tradesman insurance businesses around now, and a great way to sort through them is to check their reviews. Sure you can look at how cheap their premiums are, how fancy their website looks, how many followers they have on Facebook, but nothing works better than genuine reviews. So how do you find tradesman insurance reviews, and how can you tell if they’re genuine or not? We’ve done the research for you and can share it right here. We conducted online research on a range of insurance brokers specialising in tradies. We’ve only included reviews on third party websites, as it’s easier to trust that these are genuine. Here are the results, listed in order of the number of positive reviews. Please note these results are current at 10/08/2018. Where applicable we have linked to the source of the reviews so that you can verify the numbers, and check yourself for any changes. 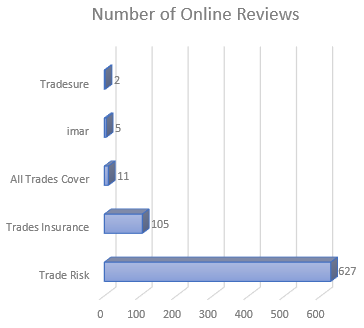 With over 600 reviews, Trade Risk has five times as many online reviews as the rest of the competition combined! The vast majority are hosted on Feefo, who require that all reviews come from verified clients of the business. Trades Insurance is the only other trade specialist to have cracked 100 reviews. Most of these are located on Trust Pilot. Some of the insurance businesses listed above did have testimonials on their websites, however for the purposes of this guide we only considered reviews and ratings hosted by independent third-party websites. What do the reviews tell us? A cynic might say that it simply shows which tradesman insurance companies chase their clients hardest for reviews! Even if that was partly true, the fact that the ratings are still very high for the companies with the most reviews show that they are doing a great job. Whilst tradesman insurance reviews are certainly a good place to start, there’s a whole lot more to choosing the right broker for your needs. You still need to look at the quality of the cover they provide, their competitiveness in terms of price, and simply whether you get a good feeling from them or not. Chances are though, a company with more positive reviews is highly likely to be ticking all of those boxes anyway, otherwise they wouldn’t be getting so many great reviews! We have done our best to put together this list by visiting the websites of each insurance broker, looking at their social media accounts (particularly Facebook) and generally searching in Google for the company name + review. We can’t guarantee we have found them all, but we have genuinely done our best. If you know of any other sources of tradesman insurance reviews that should be on our list, please get in touch so we can add them. Disclosure: This website is owned by a company that has a common shareholder with Trade Risk. We have not allowed this to influence the article.